Definition at line 180 of file llfloateractivespeakers.h. Definition at line 184 of file llfloateractivespeakers.cpp. Definition at line 196 of file llfloateractivespeakers.cpp. Definition at line 387 of file llfloateractivespeakers.cpp. References LLMuteList::add(), LLMute::AGENT, LLSD::asUUID(), LLSpeakerMgr::findSpeaker(), LLMute::flagTextChat, LLScrollListCtrl::getValue(), gMuteListp, LLMuteList::isMuted(), LLPointer< Type >::isNull(), mSpeakerList, mSpeakerMgr, LLMute::OBJECT, LLMuteList::remove(), and LLSpeaker::SPEAKER_AGENT. Definition at line 416 of file llfloateractivespeakers.cpp. Definition at line 422 of file llfloateractivespeakers.cpp. References LLMuteList::add(), LLMute::AGENT, LLSD::asUUID(), LLSpeakerMgr::findSpeaker(), LLMute::flagVoiceChat, LLScrollListCtrl::getValue(), gMuteListp, LLMuteList::isMuted(), LLPointer< Type >::isNull(), mSpeakerList, mSpeakerMgr, and LLMuteList::remove(). Referenced by onClickMuteVoice(), and postBuild(). Definition at line 461 of file llfloateractivespeakers.cpp. References LLSD::asUUID(), LLScrollListCtrl::getValue(), mSpeakerList, and LLFloaterAvatarInfo::showFromDirectory(). Definition at line 452 of file llfloateractivespeakers.cpp. References LLSD::asReal(), LLSD::asUUID(), LLPanel::childGetValue(), LLScrollListCtrl::getValue(), gVoiceClient, mSpeakerList, and LLVoiceClient::setUserVolume(). Definition at line 201 of file llfloateractivespeakers.cpp. References LLPanel::childSetAction(), LLPanel::childSetCommitCallback(), LLUICtrlFactory::getButtonByName(), LLPanel::getCtrlByNameAndType(), LLUICtrlFactory::getScrollListByName(), LLUICtrlFactory::getTextBoxByName(), mMuteTextCtrl, mMuteVoiceCtrl, mNameText, mProfileBtn, mSpeakerList, onClickMuteTextCommit(), onClickMuteVoice(), onClickMuteVoiceCommit(), onClickProfile(), onVolumeChange(), TRUE, and WIDGET_TYPE_DONTCARE. Definition at line 221 of file llfloateractivespeakers.cpp. References LLScrollListCtrl::addElement(), LLSD::asUUID(), LLPanel::childSetEnabled(), LLPanel::childSetValue(), LLScrollListCtrl::clearRows(), f, LLSpeakerMgr::findSpeaker(), LLMute::flagTextChat, LLMute::flagVoiceChat, gAgent, LLCacheName::getDefaultName(), LLAgent::getID(), LLScrollListCtrl::getScrollInterface(), LLCtrlScrollInterface::getScrollPos(), LLScrollListCtrl::getSimpleSelectedValue(), LLScrollListCtrl::getSortAscending(), LLScrollListCtrl::getSortColumnName(), LLSpeakerMgr::getSpeakerList(), LLControlGroup::getString(), LLVoiceClient::getUserVolume(), LLColor4::getValue(), gMuteListp, LLColor4::grey4, gViewerArt, gVoiceClient, LLMuteList::isLinden(), LLMuteList::isMuted(), LLUUID::isNull(), llfloor(), llformat(), llmin(), mMuteTextCtrl, mMuteVoiceCtrl, mNameText, mProfileBtn, mShowTextChatters, mSpeakerList, mSpeakerMgr, LLUUID::notNull(), LLPointer< Type >::notNull(), LLStringBase< char >::null, LLVoiceClient::OVERDRIVEN_POWER_LEVEL, S32, LLCtrlSelectionInterface::selectByValue(), LLScrollListCtrl::selectFirstItem(), LLView::setEnabled(), LLCtrlScrollInterface::setScrollPos(), LLView::setValue(), LLScrollListCtrl::sortByColumn(), LLSpeaker::SPEAKER_AGENT, LLSpeaker::STATUS_MUTED, LLSpeaker::STATUS_NOT_IN_CHANNEL, LLSpeaker::STATUS_VOICE_ACTIVE, and LLSpeakerMgr::update(). 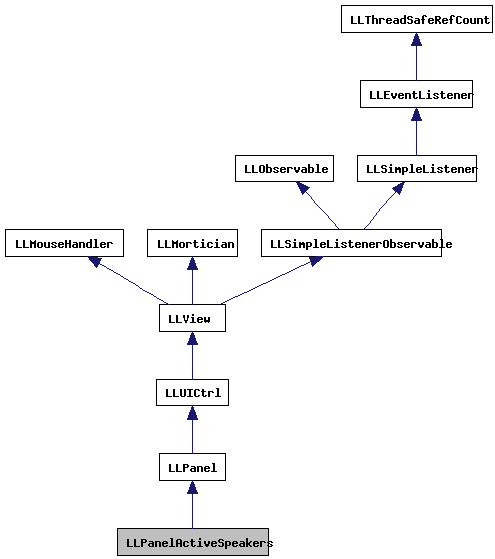 Referenced by LLFloaterIMPanel::draw(), LLFloaterChat::draw(), LLFloaterActiveSpeakers::draw(), LLFloaterActiveSpeakers::LLFloaterActiveSpeakers(), and LLFloaterIMPanel::postBuild(). Definition at line 380 of file llfloateractivespeakers.cpp. Definition at line 208 of file llfloateractivespeakers.h. Definition at line 203 of file llfloateractivespeakers.h. Referenced by postBuild(), and refreshSpeakers(). Definition at line 202 of file llfloateractivespeakers.h. Definition at line 204 of file llfloateractivespeakers.h. Definition at line 205 of file llfloateractivespeakers.h. Definition at line 206 of file llfloateractivespeakers.h. Definition at line 201 of file llfloateractivespeakers.h. Referenced by onClickMuteTextCommit(), onClickMuteVoiceCommit(), onClickProfile(), onVolumeChange(), postBuild(), and refreshSpeakers(). Definition at line 207 of file llfloateractivespeakers.h. Referenced by onClickMuteTextCommit(), onClickMuteVoiceCommit(), refreshSpeakers(), and setSpeaker().